Join the discussion on our forums! 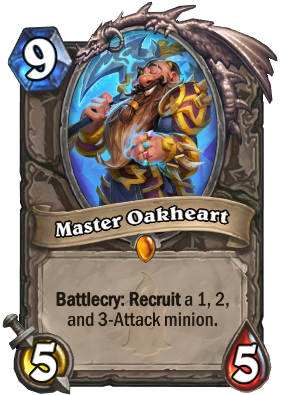 Come discuss Master Oakheart over in our dedicated Master Oakheart discussion topic. "His adventuring party consists of Goldshire Footman, Frostwolf Grunt and Hadronox"
My guess is those three are the only 1, 2, & 3 power minions in the deck. I'm probably lucky beyond that it pulled sleepy dragon and not Ysera, malygos, or deathwing. True to its flavor text, this card is seeing quite a bit of play in the Hadronox Taunt Druid. in the last expansion Witchwood there is alot of good stuff with 2 or 3 atack , WHY this card is not in the meta ??? So something I noticed was that for wild, this guy pulls out Baron Rivendare and Spiritsinger Umbra. All we need is a 2 attack Deathrattle with an awesome effect (It'll happen eventually. It's only a matter of time before they forget about him, release an insane deathrattle effect on a small 2/x body to balance it) and we've got gravy. And it's not like Baron or Umbra are bad cards in a Deathrattle deck. Could be good with Possessed Lackey orWobbling Runts. The new expansion The Boomsday Project will have a 2/2 hunter card with Deathrattle: Destroy a random enemy minion. Is the play sound Varian Wrynns theme? Location: Molten Core, Ragnaros street 15. It is the Cataclysm theme of Ironforge (Dark Iron Dwarves! ), which is made from a part of Ulduar music.